Recently Angelique contacted me on Ravelry to share her instructions for a pair of matching Leg Warmer / boot cuffs – designed to go with the Fall Poncho. You can see her daughter’s (she’s 8 years old) pair in the photo below; contributed by Angelique82 from Ravelry. “I started with a row of foundation half double crochet and connected them. I started with 31 only because that was the number that fit my daughter’s skinny leg. the number of stitches isn’t really important other than for fit. I worked this in the round using markers instead of slip stitches. Next decide where your heel will be, I mentally broke it up in thirds. 1/3 HDC chain 1/3 (skip those stitches on the work for the heel) HDC the remaining 1/3. row 4 HDC across including your chains from the previous round. row 19 alternate backpost DC and frontpost DC again. Cluster Stitch (CL): (YO, insert hook into the stitch indicated and draw up 1 loop) 3 times. YO and draw through all 7 loops on the hook. Repeat across. 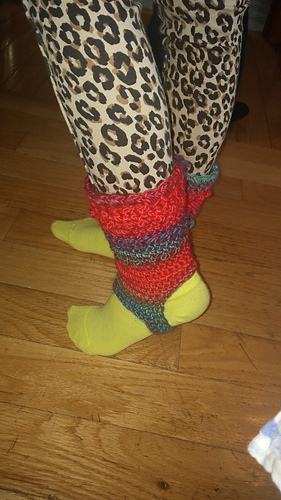 Angelique generously offered this information to be included in a post on my website – in case anyone else was interested in making a pair of matching leg warmers with their ponchos – or even as a stand-alone crochet project. If you are thinking of trying to make a pair yourself here are some standard measurements for legs for Newborns to 2-5 year old children. Becka from Warming the Heart has kindly agreed to allow me to share this chart with you in my post. Thank you Becka! Quick Note: When creating items in crochet it is important to remember about ease – for items you need to fit closely you need them to stretch to fit or else they become too loose and fall down. If you want them to slouch you need them to be the almost the same size as the shape you are trying to fit, or if the yarn you are using does not have much stretch to it, even a bit larger. So to start you will need to determine the ankle measurement of the recipient and crochet your foundation hdc row (the first row of Angelique’s instructions) to that measurement (or slightly larger). 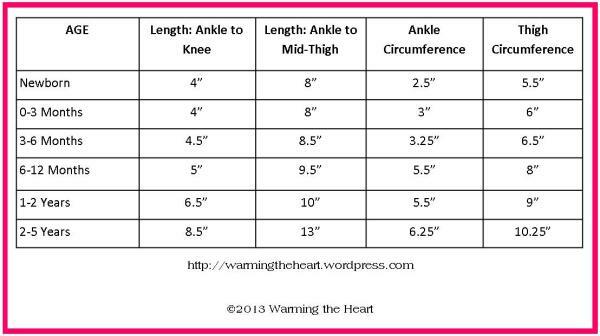 Thank you to Angelique for contributing these handy instructions and to Becka for her helpful leg warmer measurement chart!